Choo Choo, All Aboard. Train party on Sunday almost got rained on. When you throw an outdoor party in June in Oregon, you're taking your chances. Although it sprinkled a few times today it didn't rain and we were all able to enjoy the party outdoors. I was looking forward to the party because my friend doesn't throw many and she told me about all these cute ideas she had. I couldn't wait to see them. My friend Karen threw the train party. She lives WAY out in the country, an hours drive for most of her guests. Her house is perfect for kids though because she has a great fenced in asphalt area where the kids can ride tricycles, scooters and skate boards. It's a pretty drive out to her house too. Karen was on a budget for this party so sent out email invitations. She did a cute job with them. Incorporating clip art and cute train wording. 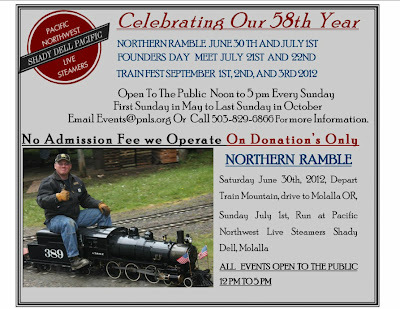 Guests we're invited to ride the trains at Pacific Northwest Live Steamers before the BBQ/train party at her house. Using construction paper Karen had on hand she created a RR crossing arm to help her guests locate her house along the country road. Construction paper was used to add some RR decor to the tables. Check out all that great asphalt for the kids to ride on. And they did too. They almost didn't sit down to eat. All the food was set up in the garage...just in case it rained. A construction paper train jazzes up the cart along with some train hats. Every party needs cake! Karen did a great job of decorating the train cake and even made a scene out of cupcakes. Green ones for shrubs, train tracks, coal cars and RR crossing signs. The kids loved it. Karen did a great job on her train party. Showing us that you can make a really cute party on a budget. Holy cats! So many cute things; it turned out great! Didn't it. I thought Karen did a great job on a limited budget. Who says you need to go ALL out and spend hundreds on a party.